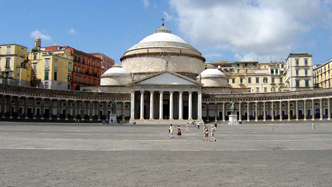 The hotel is finely located near some of the most important archaeological and cultural attractions in the province of Naples. 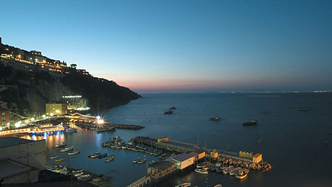 The Hotel Punta Quattroventi is few kilometers far from the center of Naples, an ideal location for day trips. 5 minutes from A3 Napoli - Salerno motorway junction, 15 minutes from the Circumvesuviana train stop Ercolano - Scavi. Trains depart about every 10 minutes. The nearest motorway junction is Ercolano, on the A3 Napoli - Salerno motorway. If you're using a sat-nav, set the address on Via Gabriele D’Annunzio, 24 Ercolano. GPS coordinates are: 40°47’40.41” N e 14°21’17.33” E.
From Naples International Airport Capodichino, you can catch the Alibus service to get to the central train station. Then you can catch a regional train to Portici - Ercolano or the Circumvesuviana trains (towards Poggiomarino or Sorrento). From the central train station you can either catch a regional train towards Portici - Ercolano and then catch the bus service no. 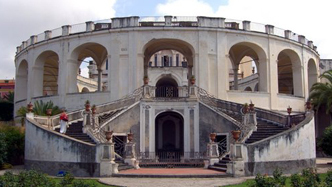 3 to get to the hotel or choose the Circumvesuviana trains towards Poggiomarino or Sorrento. 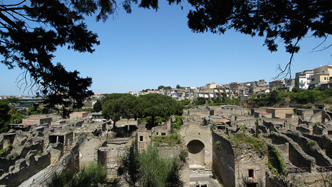 Just a short walk from the hotel and you’ll reach Herculaneum archaeological site, where the time stopped in 79 A.D. for a violent eruction of the Vesuvius. The site offers a view of how daily life was back then. There are several well-conserved spots, such as the spa and the basilica. One of the most visited archaeological sites, a motionless town that has preserved Pompeii’s two-thousand-year old art and city plan, where you can try an re-imagine what it felt like to be at the time of the eruction. 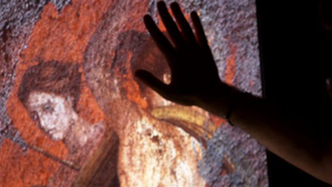 It would take days to visit Pompeii in its entirety, so we suggest planning thematic visits as a start. . 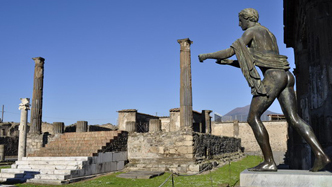 Three-day passes are available to visit all the archaeological sites of the area (Pompeii, Herculaneum, Oplonti, Boscoreale, Stabia), at the price of 20 €. MAV is an interesting virtual tour of the buried cities of Herculaneum and Pompeii, virtually rebuilt thanks to historical reconstructions, 3D technologies, interactive interfaces and holograms. The Miglio d'Oro connects Naples to the town of Torre del Greco. This scenic avenue’s name could be translated as The Golden Mile, for its view, the vegetation and the 122 baroque villas, such as the villa where the Italian poet Leopardi composed his masterpiece “La Ginestra”. 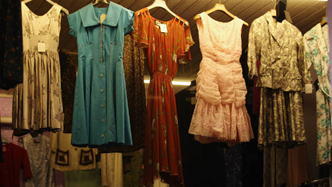 This second-hand market in Herculaneum is one of the most famous in the South of Italy, a great destination if you’re into vintage clothing and accessories. A maze of small shops with hidden gems at a bargain price, weird finds, bags and much more. An authentic time travel is within minutes from the hotel. 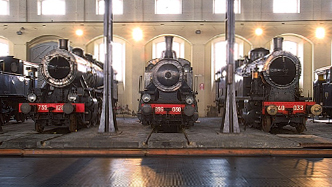 The railway museum recalls the history of Italian trains, from steam to electric engines and old carriages, right where the first Italian railway line was born. Open Mon-Fri, 8.30 am - 1.30 pm, closed on public holidays. 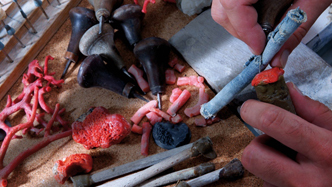 The nearby town of Torre del Greco is one of the major coral manufacturing centers. The extremely detailed cammeos are still hand-made in the artisans’ small shops. From the bottom to the crater, an astonishing climb to the top of Mount Vesuvius, to admire Naples bay and feel the strong bond between the locals and the volcano. Choose one of the thematic paths and start exploring the wild and perfumed nature. 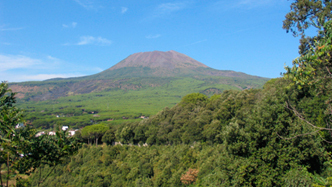 Also open to visitors, the vulcanic observatory, where active volcanoes are monitored daily. Naples is a must-see if you’re staying at Hotel Punta Quattroventi. Easy to reach by public transportation, not-so-easy to visit in just one day. But one day is enough to breathe its atmosphere, taste some of the city’s world-famous specialities, to discover its million surprising glimpses. 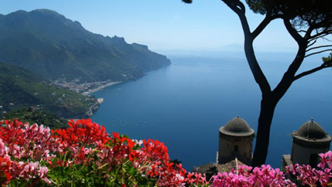 A half-an-hour car ride and you’ll get to Sorrento and the Sorrento peninsula. Two tips to get you started: don’t miss its breathtaking sceneries and local delicacies, such as Limoncello. Another top destination is just one hour away from Hotel Punta Quattroventi, the Amalfi Coast and the beauty of Positano, Amalfi, Maiori: astonishing coasts and small towns, transparent sea and great local products. 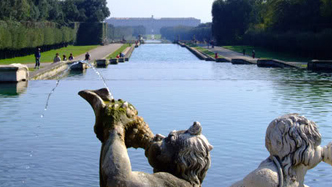 Take some time to visit the Royal Palace of Caserta with its immense gardens. Feel like a member of the royal family and walk through the perfectly preserved rooms and the many fountains and cascades. Enjoy that special dinner by the sea, or have a nice drink by the pool. Celebrate your very special moments in the beauty of the gulf.